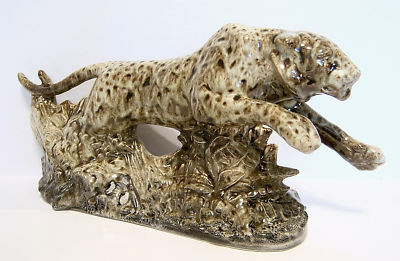 This is a highly collectable Staffordshire Cream Ware Figurine/Model of a magnificent 'Leaping Leopard'. The model figure is depicted leaping forward from a base of foliage and flowers towards an unseen prey. The entire model is created in a mottled/spotted mix of browns and fawns with a high lustre finish overall. It measures 13 inches (33in cm length with a height of 7 inches (13 cms). It is in perfect condition.